Amid all the furore surrounding Brian Cody and Henry Shefflin reaching their 10th All-Ireland as manager and player respectively, it’s easy to forget about the chasing pack. JJ Delaney and Tommy Walsh both move up to nine medals, while Jackie Tyrrell isn’t far behind with eight. 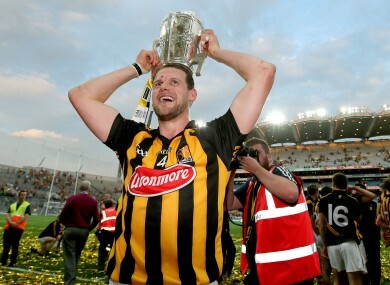 At 32, Tyrrell has no doubt he will be back again next year chasing another All-Ireland. “Absolutely, yeah. No doubt about it. The numbers are getting higher, I’m 32 now, getting old. No, look, it’s great and to even think about winning eight All-Irelands is unbelievable. Never in my wildest dreams would I have ever thought that. It’s just brilliant, great days for us. He paid tribute to Shefflin’s achievements, but added that perhaps greatest record of all-time could be equaled in a year’s time. “The scary thing about it is Tommy and JJ have nine right behind him. But it’s brilliant for Henry, brilliant for his club and his family. I couldn’t speak highly enough about Henry, his leadership and what he brings to the whole thing. The average age of Kilkenny’s starting XV on Saturday was just over 26, drastically dropping if the two elder statesmen in defence were omitted. “There was all the talk about lads being old and all that, but if you took myself and JJ off the starting 15 on Sundayyou would have had a very young team. In a kind of sly, unique way Brian has moulded in another team to carry on again. How well do you remember the 2014 All-Ireland hurling championship? Email “Jackie Tyrrell: 'Never in my wildest dreams would I have thought I'd win 8 All-Irelands'”. Feedback on “Jackie Tyrrell: 'Never in my wildest dreams would I have thought I'd win 8 All-Irelands'”.